Norway gained its independence from Sweden in 1905. As a separate realm, Norway stayed free of World War I but suffered German occupation in World War II. Discovery of oil and gas in adjacent waters in the late 1960s gave a strong boost to Norway's economic fortunes. Norway is planning for the time when its oil and gas reserves are depleted and is focusing on containing spending on its extensive welfare system. It has decided at this time not to join the European Union and the new euro currency regime. 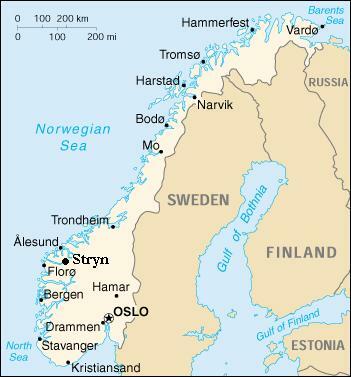 Norway has a total area of 324,200 sq km, which slighty larger then New Mexico. It shares boundaries with Finland, Sweden, and Russia. Norway's coastline includes large islands,long fjords, numerous small islands, and minor indentations. The climate of Norway is temperate along coast, modified by North Atlantic Current; colder in the interior; and rainy year-round on west coast. In the western part of Norway lies the little town of Stryn located on the Nordfjord. This is the town in which I will be living and studying. Stryn lies innermost in Nordfjord where the mountains ascend to the glacier. To see 360 degree images of Stryn, click Here It has a population of roughly 3,000. 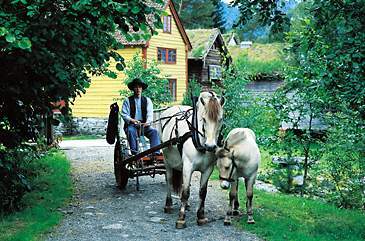 Agriculture, fishing, small-scale industry, and tourism are the most important means of making a living in Stryn. The Stryn municipality (county)comprises several separate communities. At the far end of the fjord lie Loen and Olden with their valleys leading towards the Jostedalsbreen Glacier. To view a live image via webcam of Stryn go Here. There are lots of activities on offer, many of the most exciting ones linked to the glacier with its summer ski centre and glacier walks. Tourists have been coming to these communities since the 1860s and there is a long tradition of looking after visitors. The linden leaves in the municipal crest are there because of the fact that Northern Europe's largest linden wood is situated in Flostranda in Stryn. Click Here for more information on attractions in Stryn. To see a map of Nordfjord click Here. A population of 4,438,547 (July 1999 est.) make up the friendly nation of Norway. Norwegians come from two ethnic groups: Germanic (Nordic, Alpine, Baltic) and Lapps (Sami) 20,000 people. 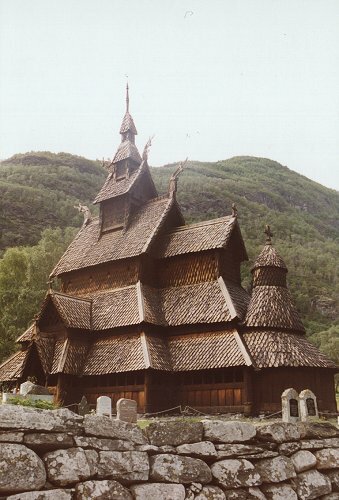 Religions of Norway include: Evangelical Lutheran 87.8% (state church), other Protestant and Roman Catholic 3.8%, none 3.2%, unknown 5.2% (1980). The official Language is Norwegian, but there are small Lapp and Finnish speaking minorities to the North.